You know the saying “If mom’s not happy, nobody’s happy”? It’s so true! 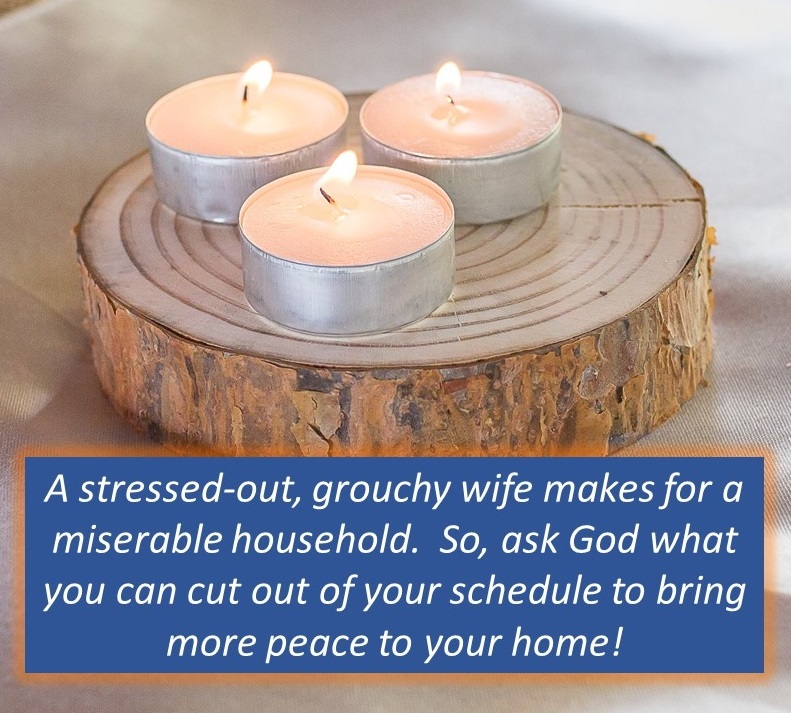 So if you’ve noticed your kids have been acting up a lot and/or your husband is grouchy, one possible reason is because YOU are not peaceful. Your mood and your stress are contagious. Ask God to reveal to you what things may be causing a foul mood or extra stress in your life, and then ask Him to show you if there are things you can do to improve the situation. Is there something stressful in your life that you should eliminate? Do you need to ask God to help you forgive someone instead of holding bitterness and resentment? Do whatever it takes to regain a peaceful and gentle spirit. God instructs wives to have such a demeanor in 1 Peter 3:3-4 where He says, “Your beauty should not come from outward adornment, such as elaborate hairstyles and the wearing of gold jewelry or fine clothes. Rather, it should be that of your inner self, the unfading beauty of a gentle and quiet spirit, which is of great worth in God’s sight.” Let’s become beautiful to our husbands and children by cultivating that gentle and quiet spirit. You may have to make some changes in your schedule, but it will be worth it!